Every year on the third weekend in August a week of high end car shows and auctions on the Monterey Peninsula ends with the beyond upscale and world famous Pebble Beach Concours d'Elegance. On the opposite side of the country a decidedly less upscale collector car event has been held the same weekend in the small seaside town of Owls Head, Me for the past 34 years. Located at the Owl's Head Transportation Museum, this annual collector car auction has long been a more low key and realistic alternative to the pomp and circumstance for New England car collectors. The Wall Street Journal posed the question of Pebble Beach or Owls Head in a blog post last Monday. For the past 12 years I have chosen to head north to Owls Head in search of interesting and affordable collector cars for their annual auction, and this year was no different. 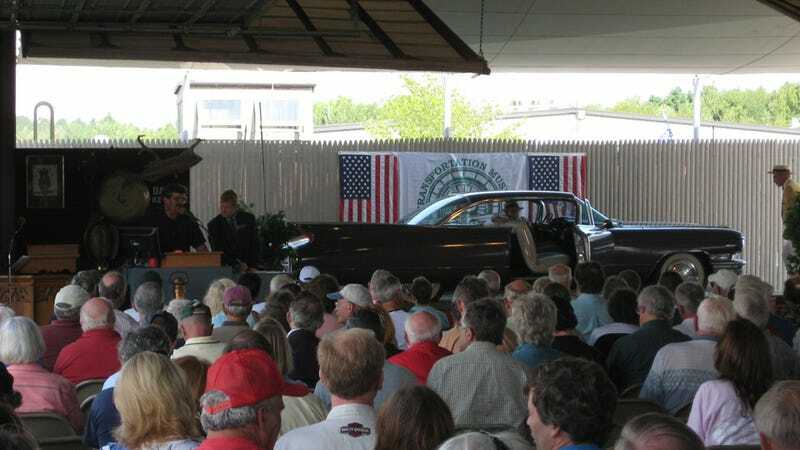 In place of six or seven figure cars that have words like provenance and pedigree attached to them, the Owls Head Transportation museum always manages to put together a diverse offering of interesting vehicles which fall, for the most part, in the $3,000-$30,000 range (with a few outliers on both ends). This year's top seller was a beautiful 1909 Overland 30 Roadster which brought $38,000. Owls Head Transportation Museum director and auctioneer Charles Chiarchiaro jokingly refers the auction as "Gravel Beach" in contrast to the upper crust west coast event. The dress is casual, the food is nothing fancy and the bidding is a little less impulsive. The result is a laid back event where you can purchase an interesting collector car even if you aren't anywhere close to a millionaire. Making it out to auction week in Monterey is a high priority on my personal automotive to do list, but at least for now I just can't grasp the idea of spending the third Saturday in August anywhere but Owls Head. Click through the Gallery above for pictures and descriptions from this year's event. Full auction list with prices realized can be found here. This pair of black 1961 Thunderbirds were owned by a mother and daughter and auctioned one after another. The Mother's car brought $7600 while the Daughter's car complete with failing clear coat and no reverse brought $5000. It's not every day you see a row of Crosleys and Split Window Volkswagens in one place. I was very tempted by the green Crosley which eventually sold for $4250. The red Crosley sold for $8700 while the brown and blue Volkswagens sold for $13,000 and $11,750 respectively. I think this beautiful 1960 Cadillac was the buy of the auction at $14,000. Dreams of cruising this big finned beast down the road while honking the car's ridiculously loud air horn have been haunting me all week. This 1940 Packard 1807 Touring Sedan didn't sell, but it was awesome getting the chance to see one in unrestored condition. Bid up to $20,500 before being passed, this beautiful Larkspur Blue on Harbor Blue 1957 Chevrolet 210 sedan had only travelled an astonishing 10,339 miles in its 54 years. For $10,000 the buyer of this 1968 Volkswagen Karmann Ghia got another half of a Ghia included in the form of this custom trailer. While many people like ourselves were drooling over this 1970 Dodge Charger 440 R/T clone all weekend, the car failed to sell. I almost brought this low and slightly ratty four door 1960 Chevrolet Impala back to the cape that rust remembered with me, but gave up bidding a little shy of the five thousand dollar mark. The car went on to sell for $6250. This 1987 Ferrari Mondial Cabriolet brought $20,500 while the thoroughly project car hell worthy Ferrari 308 GTS Targa brought $9750. The 308 was advertised as having low engine compression and had the look of a car that had been run hard and put away wet. In a lifetime of attending old car shows and auctions I have never seen a well restored 1946 Chevrolet Wrecker before and probably never will again. Someone took home this rare and unique commercial vehicle for $24,000. If you were looking for a two seat British roadster, there were plenty to be had. This 1954 Cadillac Series 62 coupe and 1955 Chevrolet 210 wagon looked like the ideal pair sitting next to each other. Neither of these black mid 50s GMs managed to find new owners. Perhaps one of the cleanest Type II Volkswagens I've ever seen, this 1973 VW Kombi brought a very reasonable $13,000. Proving Owls Head truly has something for everyone, this 1944 Ford 2N Tractor was the last lot sold and brought $1500. We are sure it will keep someone quite busy through the long New England winter.